One tale about a dog known by virtually everyone in Japan is that of Hachiko, an Akita inu. This true story is the most famous of all dog stories and has become a kind of modem legend, relayed from one generation to another and also finding its way into books, movies, and television dramas. Not only does it demonstrate the deep bond that can be formed between humans and dogs, it shows the essence of the temperament of a Japanese dog: loyalty and devotion. The legend of Hachi continues to tug at the heartstrings of Japanese people even today. The events began roughly eighty years ago, in the early 1920s, when a certain Eisaburo Ueno, professor at the Department of Agriculture at the Imperial University (now the University of Tokyo) and resident of Shibuya, west central Tokyo, became the owner of an Akita inu puppy. The puppy came from Odate in Akita Prefecture, which was well known for producing fine Akita dogs. Born in late November (the exact date is unclear) in 1923, the puppy was delivered to Professor Ueno on January 10 the following year. Professor Ueno, who had always been a keen dog lover, named him Hachi and lavished him with love and affection. 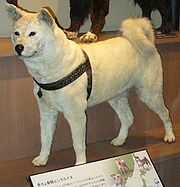 The puppy grew up to become a fine Akita inn, 64 centimeters (about 25 inches) tall, weighing 41 kilograms (90 pounds), with a sickle tail that curled to the left and a fine coat of light yellow fur. Hachiko took to Professor Ueno extremely well, and when the professor set off to Shibuya Station in the mornings, usually at around nine A.M., either to go to the Department of Agriculture at the Imperial University or the Ministry of Agriculture and Forestry’s laboratory in Nishigahara, Hachiko always went with him. After seeing his master off at the station, Hachiko would return home, and then in the evening at about six P.M. he would again set off to Shibuya Station and wait by the ticket gate for his master to appear. This became Hachiko’s daily routine. The sight of the two of them setting out for the station in me morning and coming home together at night made a deep impression on all the passersby. 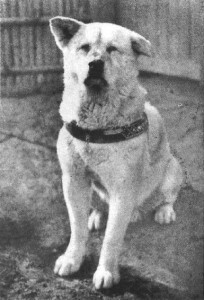 However, Hachiko’s happy life as the pet of Professor Ueno was cut short by a very sad event, just one year and four months later. On May 21,1925, Professor Ueno suffered a sudden stroke during a faculty meeting and died. The story goes that on the night of the wake, Hachiko, who was in the garden, broke through the glass doors into the house and made his way into the parlor where the body was laid out, and spent me night lying close beside his master, refusing to budge. Another account tells how, when the time came to put various objects particularly loved by the deceased in the coffin with the body, Hachiko jumped inside the coffin and tried to resist all attempts at removing him. But it is after this that the really sad part of the story begins. After his master died, Hachiko was sent to live with relatives of Professor Ueno’s who lived in Asakusa, in the eastern part of Tokyo. But he ran away repeatedly and returned to the house in Shibuya, and when a year had passed and he still hadn’t taken to his new home, he was given to Professor Ueno’s former gardener, who had known him since he was a puppy. But Hachiko ran away from this home repeatedly too. On realizing that his erstwhile master no longer lived in the old home in Shibuya, Hachiko went every day to Shibuya Station in the same way as he always had, and waited for him to come home. Every day he would go and look for the figure of Professor Ueno among the returning commuters, leaving only when pangs of hunger forced him to. And he did this day after day, year in and year out. 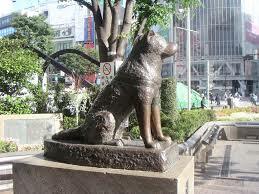 Hachiko eventually started to be noticed by people as he turned up every day at Shibuya Station. But what made him especially well known was a story that someone sent in to the Asahi Shinbun , one of the country’s major newspapers, which was published in September 1932, The writer had been interested in Hachiko for some time, and had already sent photographs and details about him to a Journal that specialized in Japanese dogs. A photo of Hachiko had also appeared in an encyclopedia on dogs published abroad. However, when a major national newspaper took up Hachiko’s story, the entire Japanese populace got to know about him, after which Hachiko became something of a celebrity. He was invited several times to make a guest appearance in Nippo dog shows, and figurines and picture postcards started to be made of him. On April 21,1934, a bronze statue of Hachiko by the sculptor Tern Ando was erected in front of the ticket gate of Shibuya Station, with a poem engraved on a placard titled “Lines to a loyal Dog.” The unveiling ceremony was a grand occasion, with the grandchild of Professor Ueno in attendance and throngs of people who caused quite a delay in the proceedings. Regrettably, this first statue was removed and melted down for weaponry during World War II, in April 1944. However, in 1948 a replica was made by Takeshi Ando, son of the original sculptor, and reinstated in a ceremony on August 15. Hachiko’s sudden fame made little difference to his life, however, which continued in exactly the same way as before. Every day he set out for Shibuya Station and waited there for Professor Ueno to come home. In 1929 Hachiko contracted a severe case of mange, which nearly killed him. Due to his years spent on the street, he was thin and battle-scarred from fights with other dogs. One of his ears no longer stood up straight, and he was altogether a wretched figure, nothing like the proud, strong creature he had once been. He could have been mistaken for any old mongrel. As Hachiko grew old, he became very weak and suffered badly from heartworms. Eventually, at the age of thirteen, in the early hours of March 8,1935, he breathed his last in a Shibuya side street. The total length of time he had waited, pining for his master, was nine years and ten months. Hachiko’s death made the front pages of major Japanese newspapers, and many people were heartbroken at the news. His bones were buried in a corner of Professor Ueno’s burial plot, so he was finally reunited with the master for whom he had pined for so many years. His coat was preserved, and a stuffed figure of Hachiko can still been seen in the National Science Museum at Ueno. The story of Hachiko has become etched in Japanese people’s hearts, and it is certainly a most touching tale of the strong bond between a dog and his master and the boundless devotion of which Akita are capable.